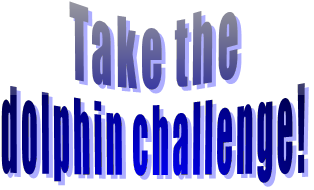 Together with Sea Watch I’ve come up with this really cool ‘Dolphin Quiz Challenge’. The first few questions are very easy, just to get you in the flow, but they get harder as you go! And guess what…if you get 75% or more you get money off when you buy The Magic Dolphin book! Cool huh ;o))))) And, don’t worry, cos if you don’t do very well the first time, you can have another go at it! The maps, cartoons and photos in the quiz are really cool so if you like it then share it with your friends, or you could ask you teacher to use it in a lesson one day. One of our adoptees wrote to me last week to say that her teacher used The Challenge for one of the ‘Under the Sea‘ lessons, and everyone LOVED it!! Well, I’ll leave you to have a go. Good luck!! !